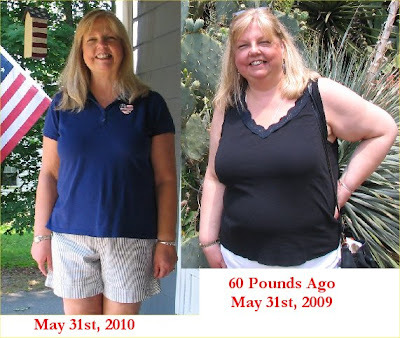 Healthy Loser Gal: Fit & Fab & Fifty Two! Fit & Fab & Fifty Two! Today is my 52nd birthday! I am so incredibly grateful to be celebrating my birthday and feeling FABULOUS! I mean it. I feel so healthy and on my way to being really fit! I want to share the comparison photos with you below. The one on the right was of me celebrating my birthday while visiting my son in Austin, TX last year. I had lost 20 lbs. then and thought I was looking pretty good! I was definitely healthier than I had been the year before. The photo on the left was taken on Memorial Day (two days ago). I've given myself a huge birthday present... I am *me* again. I'm not at my goal, but I can look in the mirror and be happy with who I see looking back at me. I'm thrilled to be celebrating my birthday with all of you. You're my support system and a darn good one! Thank you for all the great birthday wishes - I appreciate every single one of them! Here's to a great, healthy, fantabulous year ahead for us all! Happy birthday, sunshine! Have a great one. Happy birthday my friend. I hope the year ahead is EVERYTHING you want it to be because you certainly deserve it! Hugs and lot of love! Happy Birthday, my dear! Enjoy! Happy Birthday Jan! I hope you have a wonderful day. You are looking awesome. Blessings! Happiest of birthdays!! Your post reminds me of when I went from obese to "just fat" as I liked to say at the time :-) Congrats to you! Happy Birthday!!! And congratulations on losing that icky little title. You are looking great! Happy Birthday to you... You look great!!!! HAPPY Birthday, you look wonderful! Be blessed dear! Happy belated birthday!! Hope you had a wonderful celebration. Happy Birthday! You look wonderful. Thank you for the encouragement that you are. Happy (belated) Birthday! You look fabulous. Glad you feel fabulous too! You look marvelous darling. You are an inspiration!